In this episode: Janet answers letters from two families struggling with their children’s feelings around separation (a preschooler and a kindergartner). In both cases, the problem lies in how the parents are approaching the situation. 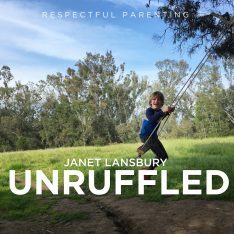 Hi, this is Janet Lansbury, and in this episode of Janet Lansbury Unruffled, I’m going to be answering a question about separation to go to preschool. Okay, I’m going to stop right here because I see that there is confusion about respect. What does it mean to respect a three-and-a-half-year-old, and how can we help her go to school or nursery? First of all, we have to do our research. We have to find a place we’re very comfortable with, or the most comfortable with. Find our best option. Observe the place. Sit there for as many hours as they’ll let you sit there and really get an idea of how they do things so that we are completely comfortable and confident that it’s the right choice for our child. Now, most three-and-a-half-year-olds could probably be ready for a few hours a week of nursery school, so this is a very reasonable choice for any child, but again, the parent has to believe in it. They have to believe in their choice. They have to have confidence in their choice and in their child to be able to handle this change, this new experience. So that is approaching this with respect. We have to decide, knowing our child, if our child is ready, and once we decide, we make that decision with confidence. Now for a child, if the leaders they need, their parents, are not confident with the decision, they’re not comfortable, they have doubts, it’s very, very hard for the child to follow along. It’s very hard for the child to say goodbye to the parent if the parent is worried that they’re not ready, that their feelings are an indication that this is the wrong choice. We have to be brave and mature in these situations so that our child can make the separation. I would not expect it to be just this seamless experience. That would be odd. Sometimes it happens. I would like to know more about how this mother has been preparing her daughter. Something that she says later is leading me to believe that she hasn’t been preparing her in the way that I would recommend, because she says, “If we are to treat our little ones as whole persons, showing respect and understanding, shouldn’t we refuse dragging them to school, nursery, or trying to persuade them how much they’re going to like it there?” I would never, ever persuade a child and try to sell them on an experience. That is another indication to the child that there is something that’s not completely comfortable with their parents about this decision. There’s not, there’s problems, there’s reasons their child shouldn’t like it. Why else would these people try to sell me on it? Why are they telling me how much I’m going to like it? Nobody knows how much she’s going to like it. Children can do this if we believe in them. But all these doubts that are going through your mind are getting in the way, because these are reflective of what you’re feeling, and these feelings are getting expressed to your child, these very sensitive, bright, aware children. They sense our feelings, so none of this is hidden from her. And then it makes it impossible. My mother doesn’t feel safe about this. Look at the way she’s saying goodbye to me. She’s all uncomfortable. She’s got that look in her eyes. I can’t let go of her. This is unsafe, this isn’t right. She’s not comfortable, I can’t be comfortable. Think about it from her perspective. It’s not a trap, but it’s saying that your feelings about saying goodbye or about trying something new, your natural feelings of trepidation and nervousness and fear, all these things that are normal when we’re trying new things, that these are convincing me that I made the wrong choice for you. These are natural, normal things for her to feel during separation, so it’s only a trap in that you are wanting it to be a seamless experience where she says, “Bye Mom! Sure, I’ll try this new thing! Yeah, go ahead” even when you’re uncomfortable. That’s not going to happen. It’s not going to happen. So I don’t know what you mean by a trap, but you have an expectation that is not realistic. I have another note from somebody with a five-year-old. A five-and-a-half-year-old who just started school who’s having a hard time with separation. So it’s not about age, it’s not about readiness so much as it’s about the parent’s attitude and the parent’s readiness and the parent’s acceptance of their child’s experience and feelings and process. Accepting it as healthy. Even good for her, that she can express this to you. Yes, so, personally, I would forge ahead with this choice, but I would reframe it for yourself and I would be the brave one in this situation that knows you’re making the right decision for your daughter. Whatever you need to do for yourself to be sure, if that’s waiting a year and finding a different school with a different process, great, but this is about you, not your daughter, in my opinion, and you’re the only one that can make this work. Hope this helps. Thanks again, and remember, you can do it! So here’s the other question that is similar to this one that I just wanted to quickly go over because it’s basically the same issue. My five-and-a-half-year-old son has just started school in Ireland. He says he enjoys it and he likes his teacher. He hasn’t made any friends in his class yet, but it’s only been just over a week and he often takes his time getting to know people. The problem is letting me go in the morning. He just wants me to stay with him at school. The first few mornings I was clear that I would be back very soon. I acknowledged that it was hard to let me go and that he would miss me. I told him I would check how he was getting on.” I just, something struck me right here. Sorry I have to interrupt but, “I acknowledged that it was hard to let me go.” Good! “That he would miss me.” I wouldn’t necessarily throw that in there unless you’re, unless he is saying that. Then I would say, “You feel like you’re going to miss me.” I wouldn’t put that out there that he’s going to miss you. 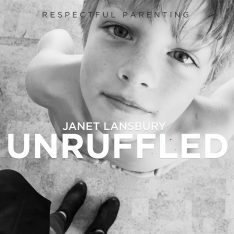 Again, this is about the parent feeling uncomfortable. And this is definitely not a betrayal of trust if she’s been clear with him about what she’s doing, what’s going to happen, that it’s okay with her if he’s upset, and you know that he’s going to see you when you get back, and you believe he can do this, he can handle this experience, and accepting that separations are messy sometimes. But we’re leaders of this so we’re the ones that have to set the tone of confidence and conviction in our choices and our child’s readiness, believe in our child, and say goodbye in a way that’s not heartbroken and “I just can’t do this again.” You know, it’s wearing on her. This is coming across to her son and that makes it impossible for him because now he’s got a really uncomfortable mother that he’s saying goodbye to and that means he can’t feel comfortable. So we are the ones that add so much onto this rather than just accepting, “Yeah you really don’t want me to go. You’re holding onto me. I’m going to take your hand off my arm. I know, it’s really hard right now. I’ll see you when I get back. I love you. Goodbye.” Bravely going off, being brave for our kids because they need this from us to be able to handle new situations. It might seem traumatic for him sometimes, but I don’t believe it’s traumatic so much as dramatic. He’s having a dramatic—not that it’s fake, but just this dramatic goodbye to somebody he adores so much. Let him have this. Let it be okay. Be the confident one. Trust your child to experience this process. I hope this helps, and remember, we can do this. Thank you for this useful article! Soon my oldest son will go to school, and I think that he can begin to cry when I go with him to school, because he is very much used to spending time with me. My wife and I have long thought about how this will all go, but luckily I came across your article. Now I’m sure that everything will go smoothly and he will be well set for studying at school. After all, for a child it is very important to concentrate on classes and get as much useful information as possible in the school. Thank you very much for sharing this interesting, important and useful article! Thank you for this article. It is very helpful as my son is starting Kindergarten next week. I have general and social anxiety and I really want to give him a confident and positive goodbye on his first day but I am afraid I will cry or get panicky. Thank you for giving us phrases we can use in these situations so our child can trust that the separation while they are at school is a good thing. This answer really falls short for me. I appreciate your wisdom on so many topics, and generally feel RIE is an excellent approach to parenting. However, to me this answer lacks profundity, love, and basic science in terms of the neurochemical changes a child goes through when separated from his or her parents. It’s all too simple to create a formulaic drop off script, and then blame the parent for revealing some of their own (probably unavoidable and definitely authentic) inner anxiety as the reason the child is having difficulty. My son is just over two and into his second month of daycare (a few mornings a week). He tells me that he likes the caregiver, likes the other kids, but doesn’t want to go back to school, and then says “miss mama.” He has done a brilliant job of accepting the new caregiver and classmates, but is struggling with the loss of one he loves, even though it’s just a few hours. There is nothing more profound and difficult any of us will experience than the loss of a loved one, and this is his first time feeling those feelings (even though it’s just a few hours, the feelings are real). 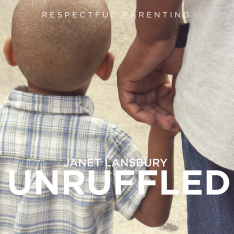 Mothers, parents, feel this deep and profound love for their children too, especially at a time of separation or when they see their loved ones having difficulty. Most, if not every parent will try to be brave and set an example of courage for their children (see the stories we’ve heard of the migrant parents separated from their children at the US border, and the incredibly brave and moving few words they often said to their kids if they had a chance…). It is ridiculous and a little inhuman to expect a parent to be a flawless wall or organized feeling in the face of this very real and challenging situation for both parent and child.